Our vented doors provide architects and designers with the ability to create simple airflow pathways. This reduces the need for vents, grilles, dropped ceilings and ducting which can interfere with surrounding design elements. 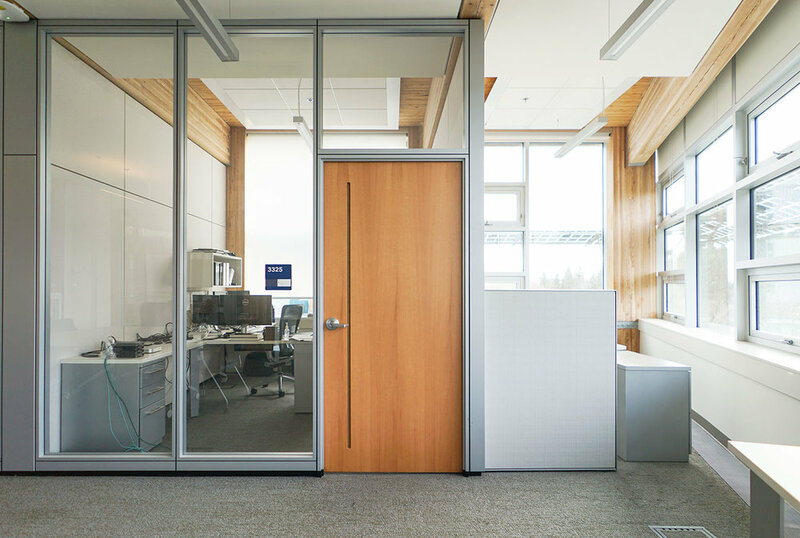 Every VanAir door can be made to specification in a wide array of widths, heights, wood veneers, and finishes to ensure compatibility with your project. Specify airflow and sound privacy performance to suit your project. We use rapidly renewable resources, demand higher recycled content, use efficient manufacturing to maximize wood usage, find wood and field chips otherwise destined for a landfill and even send our excess sawdust to local farmers for use as livestock bedding. Our sustainability focus extends into no-added urea formaldehyde glues (NAUF) and binders, no-VOC finishing, increased recycled content and third-party certification and accreditation. "VanAir provides a holistic integrated solution that deals with the acoustics and the airflow and the aesthetic." "We were able to avoid expensive transfer systems and acoustic systems because the door comes completely integrated to be able to move airflow freely while limiting the acoustic transfer between offices and adjacent corridor areas. So from our perspective, it was an ideal solution - extremely cost effective."